Dell WM514 Wireless Laser MouseThe WM514 Wireless Laser Mouse from Dell™ is a stylish, high-precision wireless mouse with a long battery life. Its laser tracking feature allows for smooth tracking on virtually any surface and provides quick response times and accurate clicking. 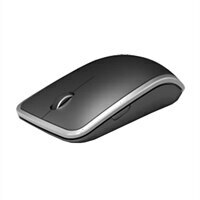 The WM514 Wireless Laser Mouse from Dell™ is a stylish, high-precision wireless mouse with a long battery life. Its laser tracking feature allows for smooth tracking on virtually any surface and provides quick response times and accurate clicking. Prices and specifications are correct at date of publication but subject to availability or change without notice. Dell cannot be responsible for errors in typography or photography. Promotional Offers apply to maximum order size of 5 systems. Dell's Terms and Conditions of Sales and Service apply and are available on request!